Features. SP Grip Drive is designed to contact the O2 sensor hex in the body of the sensor not the hex tips. Conventional socketswrenches can easily round off the hex tips. SP Grip Drive provides greater torque capabilities needed to remove rusted or frozen O2 sensors found on many of today's vehicles. Two sided 22mm wrench featuring 6 ໤ point configurations with O2 sensor wire notch. 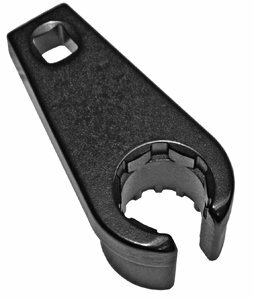 22mm wrench with notched opening is designed for non-shielded O2 sensors with wire connectors. 12 Point SP Grip Drive offers 2X the number of clock angle positions improving accessibility and performance. 2 18" Offset Wrench provides additional wrench length to access restricted applications. Item Weight - 2 lbs. If you have any questions about this product by Sp Tools, contact us by completing and submitting the form below. If you are looking for a specif part number, please include it with your message.